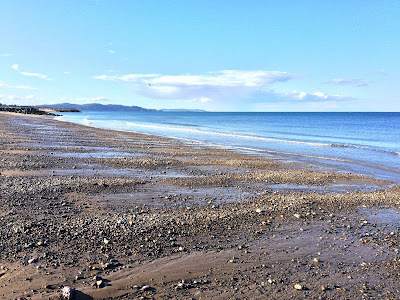 After a long day’s work today [5 June 2015], and facing another working day tomorrow, I went to Bray for a walk on the beach and a late lunch. 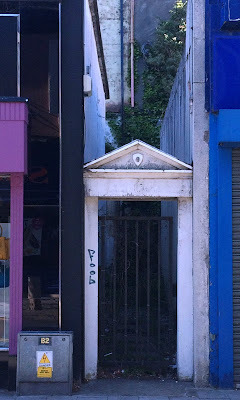 Walking down Quinsborough Road towards the seafront, I was surprised at the architectural curios and gems that can be seen in little gaps and corners. Here a gate hiding a flight of stairs, there a former bank long closed, or across the street the former Presbyterian Manse. Saint Andrew’s Manse, at 13 Quinsborough Road, is a detached three-bay two-storey manse built in 1850. This early Victorian manse with Tudoresque overtones is one of the more distinctive domestic properties in the centre of Bray. In the past it was well-preserved and it has formed a picturesque grouping with the neighbouring Presbyterian church. The front elevation of the former manse consists of three gables. The gable in the centre is smaller but projects slightly, with-single storey canted bays to the outer gables. The façade is finished in painted render with moulded drip stones to the entrance and the upper floor windows and there are small “arrow loop” and quatrefoil recesses to the gables. The pitched roof is slated and has rendered chimney stacks and rendered parapets with corbels. The entrance is set within a small recessed porch with a Tudor arch opening, and consists of a timber door with ogee-arched panels, pointed arch sidelights and a three-pane pointed arch fanlight. There are decorative “spandrel” panels between the porch opening and drip stone above it. The windows are flat-headed and have two-over-two timber sash frames. There are cast-iron rainwater goods. To the west side of the house there is a gabled gate screen, within which is a small pointed arch gateway. The building faces onto the street but is separated from it by a small garden enclosed by decorative cast-iron railings. However, this house no longer serves as a manse, and this afternoon the grass was overgrown, and discarded furniture could be seen around the front. 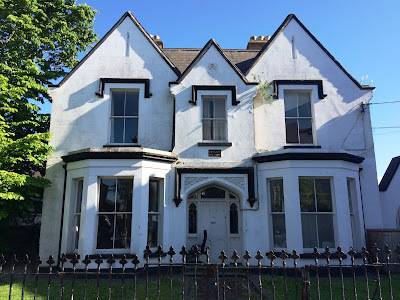 I only hope that this is not another part of the architectural heritage of Bray that could become endangered. Down at the seafront two of us had a late lunch in Carpe Diem on Albert Avenue before going for a short walk on the beach in the late afternoon sunshine. 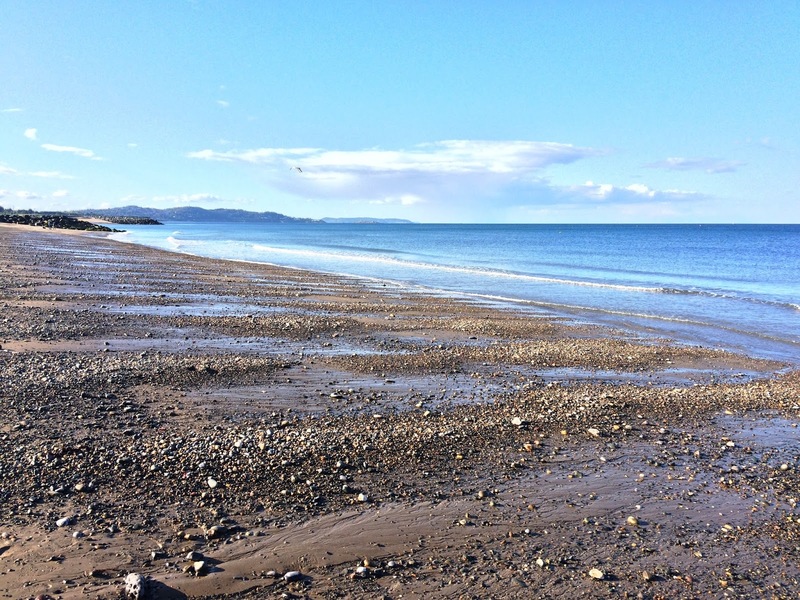 The tide was out and the sea was calm. Despite the rain earlier in the day, the temperature rose to 19 this afternoon. Perhaps summer is about to arrive on the east coast. During my visit to Lichfield Cathedral last weekend, I heard of an interesting connection between Lichfield and the ancient Celtic monasteries in Ireland. The Venerable Bede in his history says Saint Chad of Lichfield travelled to Ireland as a monk before he was ordained a priest. Saint Chad and his companion, Saint Egbert, travelled in Ireland some time between 651 and 664 for further study. Although Bede does not say which monastery in Ireland they stayed in, he places Egbert and Chad among an influx of English scholars who arrived in Ireland while Finan and Colmán were bishops at Lindisfarne. In addition, the Lichfield Gospels, also known as the Saint Chad Gospels has been dated to 730, placing it chronologically before the Book of Kells but after the Lindisfarne Gospels. Now a new discovery has linked the Lichfield area with the Irish monastic tradition and the Book of Durrow. Fragments of seventh-century Anglo-Saxon artefacts from the Staffordshire Hoard have been cleaned and are being fitted together. The artefacts include a rare high-status helmet and a unique form of sword pommel that was in 26 pieces when it was uncovered. The pommel “combines multiple different styles of ornament, much in the same way as the earliest seventh-century illuminated manuscripts do, like the Book of Durrow. It suggests the coming together of Anglo-Saxon and British or Irish high cultures,” the project archaeologist, Chris Fern, said in a Birmingham Museums press release last week [26 May 2015]. Just two days later I was taking a group of Anglican theologians and bishops from these islands to see the Book of Durrow and the Book of Kells in the Library in Trinity College Dublin. The pommel cap is the tip of the hilt of a sword that anchors the hilt fittings to the sword blade. Single pommel caps from this period are incredibly rare archaeological finds, and to find this many together is unprecedented. In all, there are over 70 pommels in the hoard. But this newly-constructed pommel is exceptional, marking a completely unique type. The conservation and research teams identified and reassembled it from 26 fragments. Although Anglo-Saxon in style, it also has British or Irish art influences. Its central garnet and glass inlaid disc can be seen to form an early Christian cross and on the other side is a motif formed of three serpents. So both Christian and pagan beliefs may be represented. This incredible object, was also decorated with gold filigree and inlaid with niello – a black inlay formed from copper, silver, and lead sulphides. The helmet was discovered in 1,500 thin, fragile sheets and strips of silver that had been stamped with designs depicting warriors, birds, animals, and mythical beasts. It had a gilded helmet band, a decoration thought to have encircled the helmet. 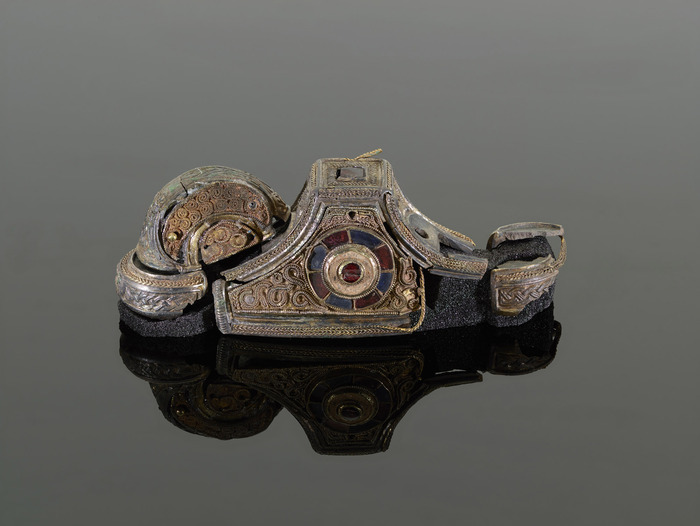 “The Staffordshire Hoard links us with an age of warrior splendour. The gold and silver war-gear was probably made in workshops controlled by some of England’s earliest kings, to reward warriors that served those rulers, when multiple kingdoms fought for supremacy,” Dr Fern explained. The Staffordshire Hoard is the largest collection of Anglo-Saxon gold and silver metalwork ever found. It was discovered in a field near the village of Hammerwich, three or four miles south-west of Lichfield, six years ago on 5 July 2009. The discovery site is near Watling Street, one of the major thoroughfares of Roman Britain, running for about 250 miles from Dover past Wroxeter, and was probably still in use when the hoard was buried. The find includes more than 3,500 items, and nearly all are war-like in character. There is nothing comparable in terms of content and quantity in Britain or throughout Europe. The artefacts have tentatively been dated to the 7th or 8th centuries, placing them in the time of the Kingdom of Mercia. The hoard totals 5.094 kilos of gold, 1.442 kilos of silver and 3,500 cloisonné garnets. It is possible that the red garnets in the hoard came from as far away as India or even Sri Lanka. Scientific analysis is being carried out to discover more. A research and conservation programme, headed by leading experts, will be underway for many years. There is a permanent display of items from the Staffordshire Hoard at Lichfield Cathedral. The origins of Lichfield Cathedral are rooted in the time scholars believe the hoard was buried. The exhibition in the Chapter House in Lichfield Cathedral explores the significance of the folded cross in the Staffordshire Hoard, the pectoral cross and the Biblical inscription, and features a small number of hoard items alongside stunning replicas. Entrance is free and tickets are not required. Birmingham and Stoke-on-Trent councils, joint owners of the hoard, are trying to raise an additional £120,000 towards the project, which will include an online catalogue of the complete hoard by 2017. The public can donate here. Or people in Britain can text STAF09 £5 to 70070.